London and Berlin, November 21, 2018 - Flexible energy options, such as energy storage, smart-charging electric vehicles, demand response and interconnectors, are needed to ensure that the energy transition proceeds on an optimal path. Our expensive power system would otherwise be reliant on fossil-fueled backup and installing excess wind and solar capacity. The ‘Flexibility Solutions for High-Renewable Energy Systems reports model a number of alternative scenarios for future power systems in the U.K. and Germany, respectively, depending on how each flexibility technology might develop in the coming years. The two studies - focused on the U.K. and Germany - highlight that policies and regulation accelerating the adoption of these technologies are key to make a cleaner, cheaper, and more efficient power system possible. •	None of the scenarios halt the transition to a low-carbon power system. In all scenarios, the renewable share of generation exceeds 70% by 2030 as wind and solar become dominant, thanks to their dramatic and ongoing cost improvements. However, without new sources of clean flexibility, the system will be oversized and wasteful, making it 13% more expensive by 2040 and with 36% higher emissions. •	Greater electrification of transport yields major emissions savings with little risk to the power generation system. Avoided fuel emissions far outstrip added power sector emissions in the U.K. The power generation system will comfortably integrate all these electric vehicles, and the system benefits are even greater if most EVs charge flexibly. However, local distribution networks are likely to face challenges. •	Accelerated energy storage development can hasten the transition to a renewable power system in the U.K., with significant benefits by 2030 including a 13% emissions reduction and 12% less fossil backup capacity needed. •	In Germany, adding flexibility supports coal through 2030, even as renewables grow to dominate the market. This counterintuitive finding is not due to a problem with batteries, EVs, demand response or interconnectors - cheap coal is the culprit. Flexible technologies are important because they can integrate inflexible generation - and in Germanys case, its inexpensive lignite plants also benefit. To decarbonize, Germany needs to address existing coal generation while investing in renewables, flexibility and interconnection. •	Still, by 2040, adding more batteries, flexible electric vehicles and interconnections with the Nordics all enable greater renewable penetration and emissions savings. More flexible demand, on the other hand, reduces the need for battery investment. •	Even with Germanys coal-heavy power, adding EVs reduces transport emissions. "There is now little doubt that renewable energy will be the dominant force in the power sector for decades to come. 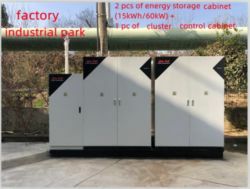 The next challenge is to make sure these sources are complemented by clean forms of flexibility - storage, demand and interconnection - to deliver cheaper, deeper decarbonization," said Albert Cheung, head of global analysis at BloombergNEF. "The relentless advance of solar and wind energy technologies are driving us inexorably towards an electricity system dominated by variable renewable power generation. Combined with the expected growth in electric mobility, we are now in the midst of an energy transition which will massively lower carbon emissions and improve air quality. However, this opportunity will be limited unless energy markets are designed and regulated in a way that unlocks the full value of flexibility in the electric system. The time is already upon us to prepare and start investing in the technologies, services, and modifications that can enable our energy system to cope with the dramatic shift in how we generate and use electricity," said Cyrille Brisson, Eaton EMEA vice president of sales and marketing. "For Statkraft, as the largest generator of renewable energy in Europe, it is interesting to see that Nordic hydropower reservoirs can play an important role for decarbonization of the European power systems, together with other flexibility solutions. This is consistent with our own analyses - confirming that a global renewables share of 70 percent is possible by 2040 if we let modern solutions for flexibility and market design allow cheap renewables to replace more expensive fossil solutions," said Henrik Sætness, SVP strategy and analyses at Statkraft. BloombergNEF (BNEF) is a leading provider of primary research on clean energy, advanced transport, digital industry, innovative materials, and commodities. With a team of experts spread across six continents, BNEF leverages the worlds most sophisticated data sets to create clear perspectives and in-depth forecasts that frame the financial, economic and policy implications of industry-transforming trends and technologies. Available online, on mobile and on the Terminal, BNEF is powered by Bloombergs global network of 19,000 employees in 176 locations, reporting 5,000 news stories a day. Visit https://about.bnef.com/ or request more information. Statkraft is a leading company in hydropower internationally and Europes largest generator of renewable energy. The Group produces hydropower, wind power, solar power, gas-fired power and supplies district heating. Statkraft is a global company in energy market operations. Statkraft has 3500 employees in 17 countries.